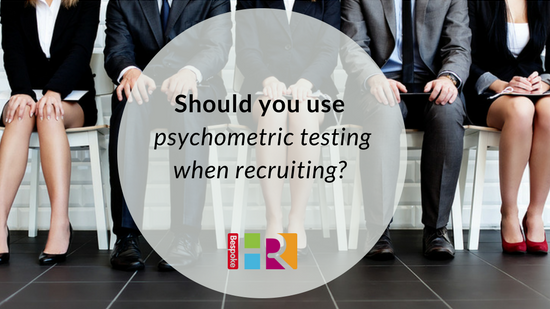 Should you use psychometric testing when recruiting new employees? Psychometric testing when recruiting and developing staff can have a huge impact on your workforce, and the wider business. Tests can assess the skills and aptitude of staff – measuring intelligence, verbal ability, numeric ability, accuracy and attention to detail. They can also provide you with an insight into how well your employees work with other people, how they handle stress, what motivates them, their resilience and how likely they are to cope with the demands of the job. Typical performance: assessing personality, interests, motivation, beliefs and attitudes. It looks at how personality concerns the way people characteristically respond to other people and situations. These include how they relate to other people, how they tackle problems, their emotions and responsiveness to stress. Maximum performance: looking at how well people can do things, how much they know and how great their potential is. Many of these tests measure general, rather than abstract, characteristics (such as literacy and numeracy). Good tests are always supported by a body of statistical evidence to demonstrate their validity and reliability. Most of these tests are designed and developed by psychologists and come with detailed manuals to help you understand the scores and results. Always make sure you are using recognised testing systems which are fully supported. Often used as part of a recruitment process, tests are also useful for understanding and progressing ongoing staff development. In turn, profiling your workforce and your top performing employees can also be useful in shaping your future recruitment practices. In 2012, The Good Care Group did just this by testing its employees – identifying the key attributes from its highest performing care workers (such as tenacity, resolve, self-discipline and resilience). The company was then able to test future candidates, looking specifically for these attributes when recruiting. Not only did it help them recruit the best candidates, but they could develop team members according to their specific needs and support them appropriately. The result was a reduction in employee turnover of 20%. However, a word of caution – whilst psychometric testing can be useful to help you choose between candidates, testing should always be used as one part of the selection process together with other selection techniques (e.g. structured interview) to avoid bias and ensure the process is fair for all candidates. What should you consider if using psychometric testing? Decide if it is appropriate to use a test at all. Will it give you the relevant information you need on potential candidates? Ensure the test is relevant to the job or person specification. Make sure you have a qualified professional to administer and interpret the results. Your HR department should be able to advise you. Consider how you will use the results – how big a part will they play in the overall decision to recruit or develop the employee? Identify any equal opportunities issues to make sure you don’t disadvantage any groups. Develop a process for giving feedback from the test. Consider how you will store the results and who will have access to them. If you would like any HR advice, we are offering 15 minute free phone consultation with one of our advisors.